The Driftless 250 is a 7-day, unsupported adventure that takes place in the beautiful Driftless Region of Southern Wisconsin. Funds raised from this event go directly to supporting the River Alliance of Wisconsin. It's like a triathlon, kinda. There is some biking, but no running. There’s camping, there's no route, and you only have to swim if you fall out of your boat. So, nothing like a triathlon. Grab some teammates and come get lost for a week. You'll help raise money to preserve the environment while you're at it. Money from this event goes directly to organizations that help preserve the Wisconsin River for future generations. When it's all said and done, you'll have some kickass stories that'll make your coworkers jealous. Entry fee ranges from $225 to $245 per person depending on how early you sign up. What do you get for your money? Start Line - Sun, May 12th - ??? The Driftless 250 will start somewhere in Madison, Wisconsin, USA. The exact start line is a secret but about a month before the event we'll mail you a hunk of wood with the latitude and longitude engraved on it. There will be no arrows to follow or mile markers. We recommend you bring a compass so you have something more to go on than, "I don't know, maybe that way?" The finish line details are a bit of a secret, but we'll tell you at the start line. It'll be somewhere near Madison, Wisconsin, USA and you'll be greeted with a cold beer. This is an unguided and unsupported event. If you get lost, get a flat tire, fall out of your canoe, or run out of rum, it's on you to figure it out. You carry your own gear, plan your own pace, forage for your own food, dig your own toilets, etc. Things might go wrong. That's the whole point. - At the end of Leg 1, we will collect your bikes and issue your team the canoe. We'll then store your bikes. - At the end of Leg 2, we will collect the canoe and give you your bike back. Other than that, you are literally on your own. Watch out for bears. The fine folks at Wheel and Sprocket and Wisconsin Canoe company are helping with the logistics. You must bring a bicycle for each team member and any necessary safety equipment for biking. You are also responsible for bringing the necessary camping gear to survive in Southwest Wisconsin for 7 days. We offer outfitting services if you fancy or just want some pointers on what to bring. We'll provide you with a canoe, paddles, and life vests. We'll take care of all the logistics (see 'Support' above) for the bike, canoes, etc. Additional questions? Ask a Pioneer or our crew at https://www.facebook.com/losttravelco/. Yup. There are plenty of brave souls out there looking for a partner. Post a note on our facebook community and we’ll help connect you. Worst case? Just show up at the Kickoff Party and act friendly. No. You will get no cheers for finishing first. Last place will probably have the best stories. Just try to finish before the snow hits. Wisconsin gets chilly in the winter. Seriously, where does the race start? Seriously, we will mail you a chunk of wood (probably cedar) with the latitude and longitude of the start line carved into it. You'll receive this about a 4-6 weeks before the event starts. Plan on being within 15 miles of downtown Madison, WI, USA on May 11th. If you're flying in, book tickets to/from MSN (Dane County Regional Airport). You can also catch a bus up from Chicago’s O’hare (ORD). You must bring your own bike. If you want to arrange a bike rental, get in touch with us. We know a guy. You also need to bring your own camping equipment; we recommend you pack light. We also offer outfitting services if you fancy. A tent or hammock and anything else you need to camp with would be useful too. Don't bring more than you can carry on a bike. We also recommend you bring a bring a map and compass. Don't bring GPS unless you want everyone to laugh at you. If you’re traveling from far away (Toronto, San Francisco, or other faraway lands) and need help coordinating a bike rental let us know and we can help, we’ve got a bike guy. You will need to bring/buy your own food and water but our sponsors have done most of the heavy lifting for you. You’ll never be more than a few (dozen) miles from civilization so if you’re running low on cheese curds you can stock up pretty easily. Sand bar, corn field, Motel 6... It's your call. Camping is available along the entire route. Camping on the islands of the Wisconsin River is free and doesn‘t require a permit. 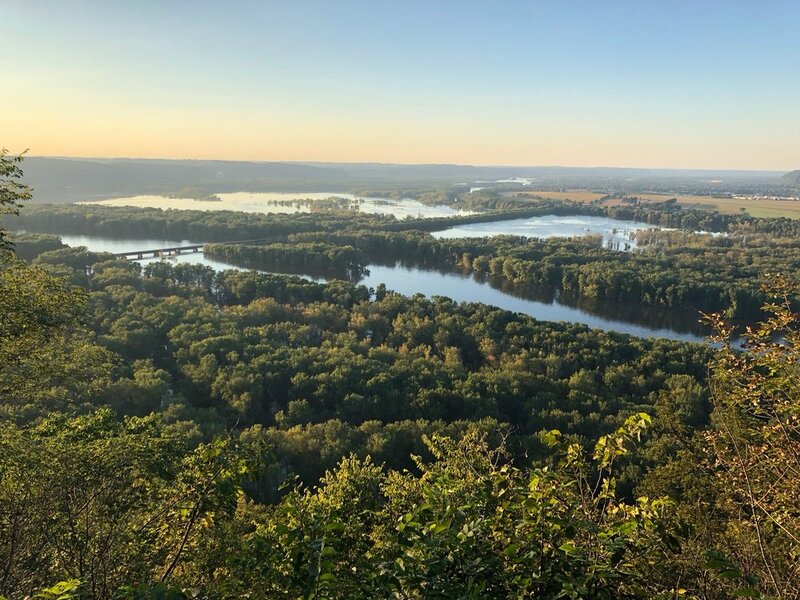 Wyalusing State Park and Governor Dodge State Park are good spots to pitch a tent when you're back on dry land. If you're looking for something more posh, we recommend a night at The Don Q Inn or Honkers. We don't care. It will make for a good fire starter, so maybe bring it? You must be at least 18 years old to take part in the event. Don't ask for a refund. You'll regret not doing The Drifty. But if you have to cancel, send us a note at least 30 days before the event and we'll let you off the hook. There will be a surprise or two. That's all we can say. I am a Pioneer of the original Driftless 250, do I get any special treatments? Thanks for subscribing. You’re in for a treat!